There are a few guiding parameters to choosing your nursery colors. I know it sounds boring, but I'll be quick so bear with me! A quick crash course in color theory will help you to develop a sound, balanced color scheme for your nursery room. This is what a color wheel looks like - I will be referring to it throughout this page so take a good look! Boy's nursery rooms can cope with any color on the color wheel except shades of pink and purple. Girl's nursery rooms can accommodate any color including blue and red as long as they do not dominate the color scheme. Gender neutral nurseries should not have pink or purple or a predominance of blue or red in their color schemes. To be on the safe side, keep your baby nursery colors simple with two main colors and an accent color or two. Obviously this is a guideline, not a rule - if you feel adventurous go to town! Think about using one color for the lower half of the wall and another color for the top half with a border between the two, or consider three walls in one color and one focus wall in a second color. Keep your main nursery colors within the same family, for instance bright with bright, pastel with pastel, muted with muted. Add interest by adding splashes of accent color from another family. For example, use muted shades of blue on the walls and add splashes of bright red around the nursery in the form of cushions, lamp shades etc. 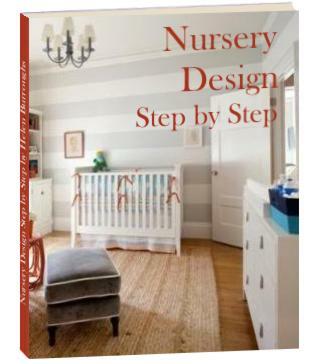 If you are looking for a fail safe, gorgeous nursery color scheme, you can't go wrong by starting here. It makes coordinating your nursery colors an absolute breeze! Colors are divided into warm, cool and neutral categories with each category setting its own mood. Cool colors include blue and green. They have a calming effect and give the perception of space making them a good choice for a smaller baby room. Warm colors include red, pink, orange and yellow. They have an inviting effect and give a feeling of coziness. This makes them a good choice for larger nurseries. Neutral colors include white, cream, ivory, beige and brown. They can be used as an anchor for bolder colors or to tone down an otherwise overwhelming color scheme. Neutral colors also give the perception of space. Using a palette of different hues of one color. For instance blue. Combining colors that lie opposite one another on the color wheel. For instance, yellow and violet. Using colors adjacent to one another on the color wheel. For instance red and red-orange or green and blue-green. Decorating with three colors that are of equal distance apart from one another on the color wheel. For instance blue, yellow and red. Take these few basic rules into account when you choose your baby room colors and you really can't go wrong. Click here for a few tips on how to find the best baby room paint colors for you and your baba.